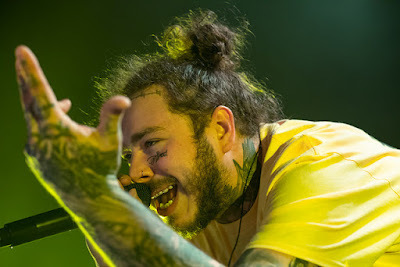 Austin Post or otherwise known as Post Malone is one of the most influential artists of this time. His music hits the charts just about every time he releases something and he has been climbing to the top ever since he released his first song 'White Iverson' in 2015. To many he seems overrated and overplayed but to me I think he was interesting and great enough to choose for my blog. The reason I stand behind this statement is because Post Malone challenges music more than many would think. He makes a point to never solidly stick to just one music genre. Before he was Post Malone he would upload covers on Youtube, in these you can see the real raw talent he has and his love for all genres of music. He can sing, rap, and play guitar which is the perfect recipe for music now a days, he can do just about any genre with ease. Another reason why I chose him is because of his personality and how he maintains being humble regardless of his money and success. He still talks about how much of a video game nerd he is and all his hobbies he enjoys, which a lot of famous people lack to share out of fear of embarrassment. This article is the classic Rolling Stones interview that every famous artist gets to partake in. In this article you can see exactly just how Post lives his life, what he likes to do, what things are around his house, his girlfriend, etc. I think that this article highlights who he is outside of just his music. It also touches on his past and childhood. This article is a really interesting twist on why Post Malone is so successful and why he is constantly on the top billboards. The article explains a little more about how Post formulates his music and how his voice influences an audience. This article mentions a lot about his past, how he moved to Los Angeles and even how he created the name Post Malone for himself. It even gives a different perspective on why he is so successful.